As night faded from the front windows, a pallid dawn filled them. She prepared for his visit. Leaning over the porcelain bowl to wash her face, she read an indecipherable text in its cracks. It would take hours to prepare because she must rest after each task. Moving in increments of will, stars burst beneath her eyelids if she went too quickly. Her hands seemed independent, taking up a hairbrush, a washcloth, the buttonhook. Every object in the room seemed far off and yet she saw with utter clarity, as if magnified. Of her two good dresses, both now fell from her body. Needing no corset, she set it aside. Her bosom had flattened and a hollow marked the center of her chest. She chose the black silk. Its sheen was dull, like the coal she could not afford to burn, and whale stays gave it shape. She took half an hour to arrange her hair, combing it through with water. Straightening her collar, she pinned a paste brooch at its center. She could not avoid the mirror: You go not, till I set you up a glass where you may see the inmost part of you. She was so altered as to be wholly unacquainted with who she had become. Mr. Hawthorne would meet her revenant. By afternoon she lay on the bed, hands trembling. She considered calling down to the Walker’s to refuse Mr. Hawthorne entry to the house. She has enough presence of mind to notice that anxiety makes one stupid. She would need calm in order to impress. Mr. Hawthorne had extended funds and Delia needed more than funds, she needed his good name. His foot was on the stair. Mrs. Walker chattered away, breathless from the climb. He was ushered into the front room. She listened through the door. “Mr. Hawthorne to see Miss Bacon,” Mrs. Walker called. A chair scraped the floor. Pages turned, he cleared his throat several times, but was otherwise silent. She felt the nervousness that used to precede her lectures in New York, when close to two hundred faces stared back from the long hall. Then, she had needed no notes; confidence had been a trick with her, and knowledge — the drumming into her brain of detail, of fact. He stood as she entered, bowed. She had kept him waiting for longer than was polite, but no amount of time could have prepared her for his face. She stammered an apology, momentarily disarmed. He did not speak at first, but motioned, pulling out the chair. Dark, thick hair was mixed with gray, and a brown moustache extended above a delicate mouth. He was tall, and wore a black frock coat; at his throat was a knotted scarf of white silk. She stared at his immaculate neckerchief as if she might disappear into its folds. She thought it the prerogative of the recluse to be frank and it was with utter guilelessness that she gazed at him. But she felt that it was in fact mere loneliness that had robbed her of necessary pretense and Delia was suddenly ashamed – of her appearance, of her poor rooms, of what she needed from him. “I have become picturesque!” She blurted, sitting down. He smiled with great gentleness. She took the hand extended. It was warm and soft and enveloped her own. He gave her back her courage with his touch. Her eyes filled with tears for she saw he was sincere. He smiled again and she averted her gaze for fear of dissolving under his consideration. He drew up the only other chair in the room. He’d had time to take in the piles of books on the study table – Raleigh’s History of the World, Montaigne’s Essays, Bacon’s Letters, Essays, and Meditations, a volume of the plays, a well used pocket Bible. More books were stacked on the floor. A large roll of manuscript lay partially unfurled. Lists neatly proclaimed their facts. A paper knife to cut pages lay across notes. She had the odd sensation of seeing these objects anew, and seeing too that their arrangement appeared theatrical — a stage with pen and ink-glass set aside, mid-composition. In fact, here was the site of a great battle. She thought how strange it is when one’s intensions take on the appearance of staginess, as if one’s life is a fiction – oneself an actor. The scene, even to Delia, was suggestive of Mr. Hawthorne’s own Romances. The vitality of his presence momentarily confused her and she sat in the chair as if she were the guest – a visitor to her own rooms. She thanked him for coming and for his notes and told him he had sustained her at a time of great trial. She nodded. This was of course the case. “But you do not share my faith?” she asked, recovering herself. “And yet you offer help.” She felt encouraged by his interest if not his opinion. “That she is,” he said, smiling. She brightened as she spoke, and gathered strength, but feared that he held little interest in the vagaries of her philosophy. Yet something in her manner compelled. What questions orthodoxy, she knew, was potent to him. She saw he felt her truth. Viola slunk in, tilting her triangle head up at Mr. Hawthorne. She let out a cry. “Ah, you disagree, Mr. Cat,” he said, addressing the animal at his feet. She wailed again and rubbed her face against the edge of his boot. For emphasis she placed her hand on the huge volume. Words are spirit – her father’s admonition. Mr. Hawthorne was not so ungentlemanly as to continue to correct her. There is no complacency in the plays, but Delia had found something like it in her certainty. If he thought her peculiar, he was a man for whom peculiarity was a rare value. He told her that his years in Liverpool had shown him all manner of strange things, but that he would try to be of assistance. Delia told him that she needed to travel to Stratford-upon-Avon, that she would find evidence beneath the gravestone. She said she’d found clues in Bacon’s Letters and wanted to leave for Stratford as soon as she was well. She was becoming impatient, but Mr. Hawthorne’s mildness encouraged her further. “You will read this manuscript with greater satisfaction and interest if you don’t bolster up your mind beforehand with any such false view as that. I mean with the idea that it is not true. It is true,” she said. He adjusted his neckerchief, but said nothing. “I hardly think …” he began, but she cut him off. Silence fell between them. Delia suddenly spent, unable to sit up straight, unused to company and the effort required to convince. She had lost the habit of conversing with real people and insisted too much and without consideration for Mr. Hawthorne’s gentle courtesy. He changed the subject. He spoke of Sophia’s illness, of his children, of the strains of working at his consulate tasks, which left him no time or energy for literature. People claiming to be citizens appeared daily to solicit funds either to return to America, or because they recognized in him a generous nature. He admitted to having been shrewdly cheated more than once. He gave her ten pounds. She took it with the unuttered acknowledgement that her earnestness had not produced in him even a temporary faith. He promised to work on her behalf to secure publication and knew English publishers likely to see of the merit of her philosophy. Perhaps, she thought, she had charmed him, when it was his faith she really wanted. He promised to consider writing the preface to her finished work, ensuring its serious consideration, and linking the name of Bacon with his own. Perhaps Mr. Hawthorne saw her as a genuine scholar in a world of counterfeit. Had seclusion, single-mindedness and dedication, revealed to her something hidden from those who, like him, must serve the material purposes of the world? She could have told him that a prophetess must remove herself from ordinary life. The effort to impress had left her hollow. She had played her part with enough conviction to leave her blank. The onset of a neuralgic attack loomed. Minutes after Mr. Hawthorne left, Delia fled to bed, still wearing her coal black dress, boots buttoned to the ankle. Sheridan Hay holds an MFA from the Bennington Writing Seminars. 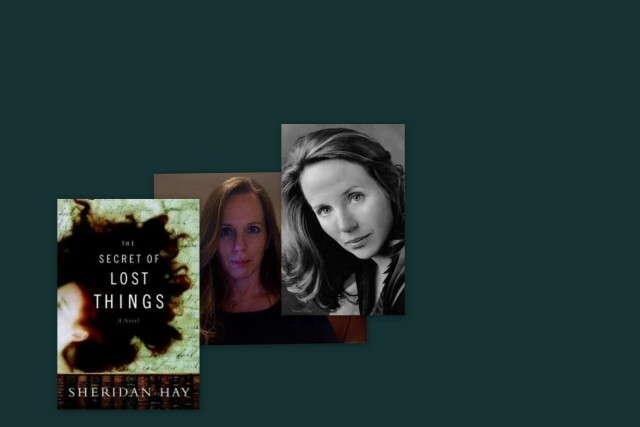 Her first novel, The Secret of Lost Things (Doubleday/Anchor), was a Booksense Pick, A Barnes and Noble Discover selection, short listed for the Border’s Original Voices Fiction Prize, and nominated for the International Impac Award. A San Francisco Chronicle bestseller and a New York Times Editor’s Choice, foreign rights have been sold in fourteen countries.